On Mindanao, the biggest southern island of the Philippines, there is a school that fills an important void in the region. ALCADEV (Alternative Learning Center for Agricultural and Livelihood Development) provides secondary education to the indigenous people in the region – the Lumads – relevant to their culture and needs. The school offers education mostly in the field of sustainable agriculture, integrated in an alternative learning system. They focus on interactive ways of education. A way of learning that provides the students not only with theoretical but also with practical knowledge about subjects like Maths, History, English and scientific and sustainable agriculture. A way of learning which aims to prepare the students for their future position as leaders of their community. One of the most important skills the students acquire during the learning process is, therefore, the responsibility for the livelihood of their community. ALCADEV is not the only school in Mindanao which fights with its alternative learning methods against illiteracy and innumeracy of the indigenous youth. There are more than 146 similar alternative schools and programmes across the different regions in Mindanao. The operation of these schools is essential for students coming from the poverty-stricken mountain communities of the Caraga region who cannot afford going to other schools because of transport and living expenses. There is, however, a serious threat for Lumad schools. The Caraga region is situated in the northeast, a largely mountainous section of Mindanao highly abundant in minerals, which makes it an attractive area for exploitation by foreign mining industries. 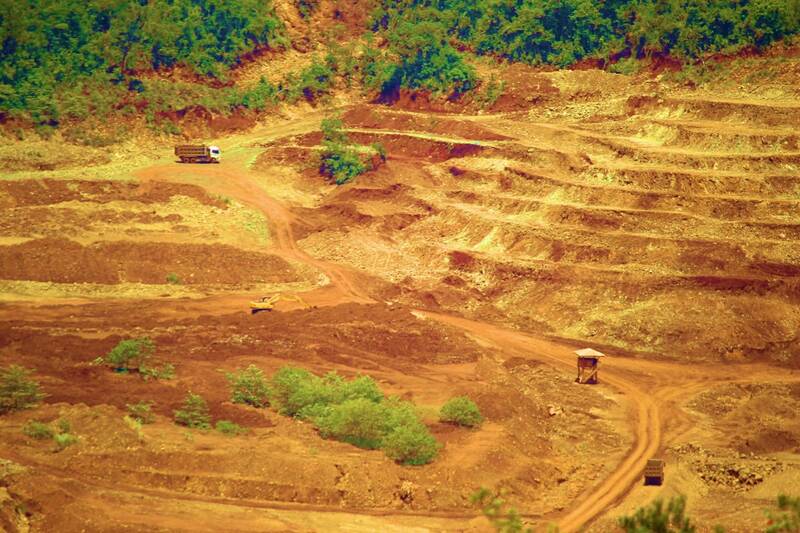 The region has the 4th largest copper, 3rd gold and the 5th largest nickel deposits in the world. Besides, Caraga also has one of the largest coal reserves in the country, which is targeted by foreign extractivist companies. As a result of the privatized electricity in the country, foreign businesses have been encouraged to invest in the energy industry. They became even more active in the field of coal extraction and have started up hydropower projects at the rivers and lakes of Caraga. Although the region’s mining resources had already been exploited in the pre-Hispanic period, the scale of resource extraction has never been as large and destructive as it is today. During the boom of neoliberal politics in the 1990’s, the Philippine government accepted the Mining Act in 1995. By this law the government clearly attempted to boost the economy by direct investments from foreign companies. Under the Mining Act, twenty-five percent of the country’s land area became potential mining territory, which mainly overlapped with the area where indigenous people live. By the end of 2017, 23 of the country’s 48 large operating metallic mines were in Caraga. Despite the promises of economic development, Caraga remained one of the poorest regions of the Philippines. Mining activity could clearly not provide long-term jobs for the locals. Most workers in the mining industry are employed by contractual basis, usually for a maximum of 7 months. Apart from the unsustainable employment factor, mining entails other serious environmental and social consequences. This situation in Caraga is very similar to the one other mining regions in different continents face. Landslides and flash floods are becoming a daily occurrence in many parts of the region as more and more of its lands are destroyed. Furthermore, the contamination of potable water sources, poisoning of the air, water and soil, siltation of the coastline and natural waterways, the degradation of nearby fishing grounds, the destruction of habitats and the decrease in biodiversity all belong to the unavoidable environmental impact of extractivism. Moreover, the intense extractivist activities and its governmental support are responsible for a high level of human rights violations in Caraga. Since 2005, the Lumad people and schools are targeted not only by mining but at the same time by massive militarization. The government continuously deploys military and paramilitary forces in the area and works together with private forces in order to ease the entry of foreign businesses. On top of that, current president Rodrigo Duterte tries to eliminate opposition to these government programs through the National Internal Security Plan (the Oplan Kapayapaan). It targets Lumad leaders, members of progressive organisations and environmental advocates who are fighting against large-scale mining. According to the counter-insurgency campaign of the government, these progressive organisations and alternative schools, such as ALCADEV, are part of the New People’s Army – the armed wing of the Philippine communist party – and are indoctrinating the children in socialism. Therefore, they are seen as enemies of the nation. Furthermore, Mindanao is under Martial Law (direct military control of civilian functions of government) since 2017. This situation gives the government the opportunity to use instruments like trumped-up charges and extrajudicial killings in their campaign against indigenous leaders. Only since Duterte came to power in 2016, there have been 30 extrajudicial killings related to mining. Also schools find themselves under permanent threat of bombing attacks and every year entire communities and schools have to be evacuated. This December and January there were also two bombings and food blockades in the region resulting in the evacuation of 300 individuals. Apart from the obvious inconvenience of the recurring evacuations, the students and teachers of the schools need to face the difficulty to rebuild the whole infrastructure (including crops and livestock) everytime they go back to their settlements. Because the Lumads keep going back to their ancestral land, they keep resisting the large-scale mining industry. Schools like ALCADEV and non-profit organizations like the TRIFPSS Inc. (Tribal Filipino Program of Surigao del Sur) are essential in this struggle: they empower and support the indigenous communities. Enhancing the self-determination of indigenous communities could be, namely, an alternative for development in Caraga. Starting up different food security programmes by local communities shows also that there is another way for development, apart from large-scale mining. The question remains, however, whether the government will be willing to change its politics and protect the ancestral lands of the Lumads from foreign investors and from the increasing environmental disasters. During the Open Min(e)d Academic Speakers Tour in March, CATAPA welcomes two speakers from the Philippines who can tell more about the perspective of the Lumads in this mining case. Maricres, who has been working for years at ALCADEV, and Norma, who represents the TRIFPSS as the Executive Directress of the organization.